For those in London and environs: I would love to see you next month at "Seize the Day," a special Day of the Dead inspired program taking place at my all-time favorite institution, The Wellcome Collection, on the evening of Friday, November 2. I will be giving an illustrated talk as part of the wonderful-looking evenings line-up that will also include drinking, dancing, and general death-related merriment. Full details follow; hope very much to raise a glass with you there! Experience a brush with death at our special Friday-night late, and explore what death has to tell us about life. If you knew you were going to die tomorrow, what would you choose to do today? How would you like to be remembered after you die? And what would you like to achieve before you go? Ponder these questions while enjoying stimulating talks, enchanting stories from around the world and activities throughout the galleries. Enjoy a drink while listening to a Dixieland jazz band. Decorate a coffin, pick up some dance steps in our special ‘Last Dance’ class and design your ideal fantasy funeral. Join us to embrace the inevitability of death and celebrate while we still can! • ‘Immortal Dream’ from Contemporary Vintage. This event is free, so drop in any time. Talks are ticketed and tickets will be available on the night. 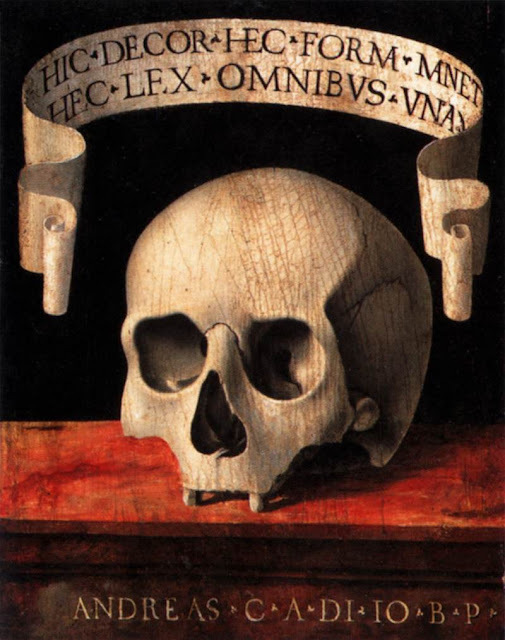 Image: Memento Mori, Andrea Previtali, 1502; Museo Poldi Pezzoli, Milan ; sourced here.